Book the whole site for your staff party or training event & enjoy an afternoon or evening of fun boating! We offer straight boat hire choosing from the entire range of boats. (Motor boats, row boats, pedalos, the river ferry, canoes, & kayaks).BBQ available. See the Adult Group Activities with Leam Boat Centre for more information. 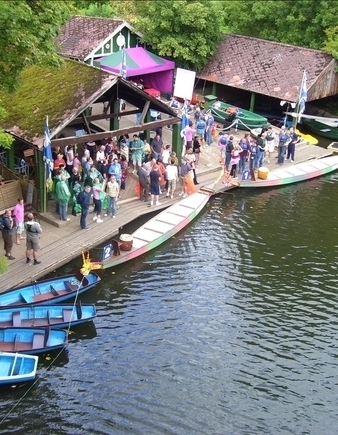 Or you can choose from our team building activities such as the Warwick Boat Race. Incorporating a raft building session, it’s a team relay event that involves rafts, pedalos, row boats, canoes & kayaks. Great fun all set against the medieval scenery of Warwick Castle. Half day & full day sessions introducing you to canoe & kayak skills. Whether you just want a taster or are preparing for your own adventures we can show you the basic skills, safety procedures & give you a range of the latest boats to try out. Day or weekend journeys through the beautiful Wye valley. We can arrange B&B or overnight camp. Challenge your team on the rookie rapids at Symonds Yat amidst the scenic Forest of Dean. See the Adult Group Activities with Leam Boat Centre for more information. Training days and weekends are currently offered at Warwick Boats, Leam Boat Centre, on the river Wye (Forest of Dean) & river Dart (Devon). Training can also be organised (with notice) at a location of your choice.